Liverpool manager Jurgen Klopp says he cannot give Daniel Sturridge any tips about scoring more goals. 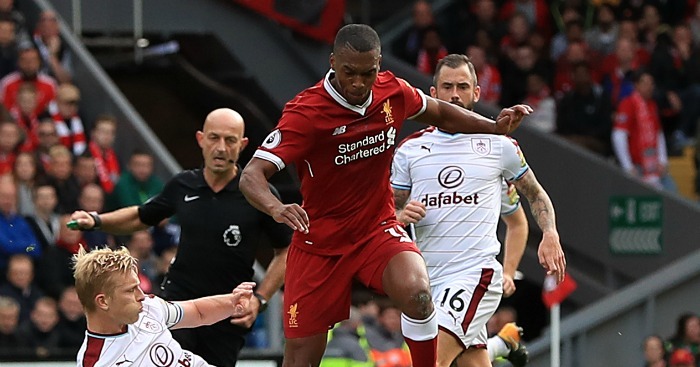 Sturridge started up front for the Reds against Burnley on Saturday afternoon and took seven of Liverpool’s 35 shots in the 1-1 draw. For more analysis of Liverpool’s failure to score more than one goal, read Daniel Storey’s Winners and Losers. “It’s not allowed for us to be happy or satisfied abut we cannot question everything. I can see the good and bad things,” said the German in a bristling press conference. “Daniel has not had many minutes, but he was really good for 90 against Burnley – always involved. “I don’t think I can give Daniel (Sturridge) a lot of tips on how he can score more often. He’s a really good striker. “When we don’t score the first goal it is like this (pressure) and you can feel it in the stadium.